I’ve gathered my recipes, made a list, and like all of you, today is the final shopping trip for tomorrow’s dinner. Making the grocery list got me thinking about all the different turkey stuffings. Everybody has a favorite, and they are all so different. And the ingredients! Apples, raisins, walnuts, wild rice, mushrooms, oysters, chestnuts! And that’s only a few of the options. What’s your favorite kind of stuffing or special ingredient? Are you a softie or a crunchie? Are you an innie or an outie? 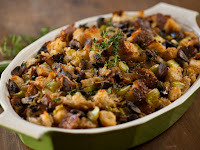 I adore stuffing, but I guess you'd say I'm a purist...no newfangled ingredients for me. The thought of oysters makes me ill (of course, since I don't like seafood, that kind of goes without saying, lol) just give me bread, celery, and whatever else my mom uses. (I admit-I use Stovetop myself). I do believe in cooking in the turkey! A little crunch is good-but not too much! I'm more of a softie, I guess! Happy Turkey Day! Happy Thanksgiving everyone! This holiday is not celebrated in Holland, but I do envy you all those great things to eat! I would love to try a stuffed Turkey and all the things that traditionally accompagny it. It is just not done here. I don't even know if I can buy a whole turkey somewhere and try it for myself. Oh yum! Thank you for sharing this recipe. I believe I will do a wee copy and paste to share with DH.